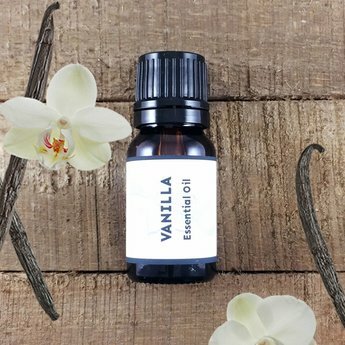 Vanilla (Vanilla planifolia) essential oil has a sweet, bouquet with a woody undertone. A scent that awakens passion (especially in men) and delivers a gentle euphoria. It encourages dreaming and promotes a restful sleep. This is a 10% dilution in a base of fractionated coconut oil. Add to a blend of oils as a base to a perfume as a fixative. Vanilla brings out the scents and makes for a nice undertone. Atlas cedar, bergamot, frankincense, jasmine, lemon, mandarin, neroli, rose, sandalwood, sweet orange, vetiver, ylang ylang. Fun facts: Native to Mexico and central America. Vanilla was added to foods to enhance flavor during the time of the time of the Aztecs.